The Voynich manuscript is an illustrated book (codex) hand-written in an unknown writing system. The book has been carbon-dated to the early 15th century (1404–1438), and may have been composed in Northern Italy during the Italian Renaissance. 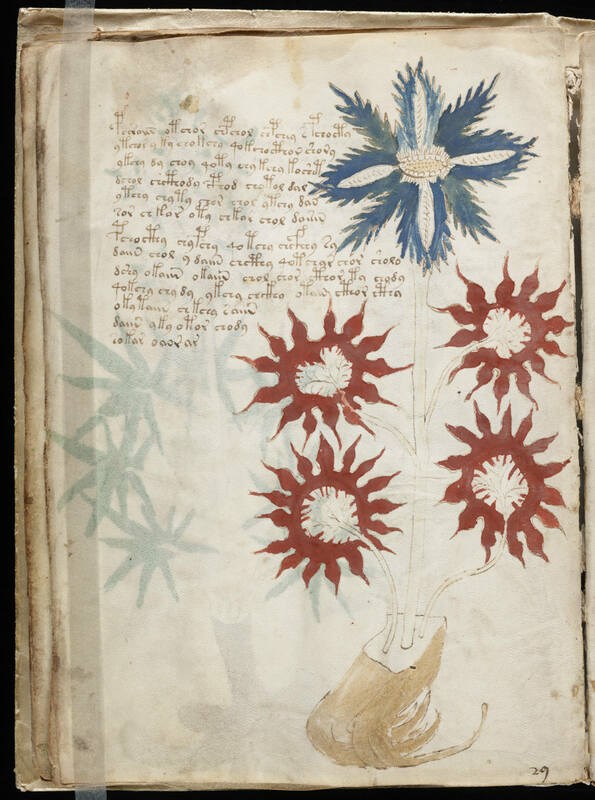 The manuscript is named after Wilfrid Voynich, a book dealer who purchased it in 1912. A floral illustration on page 32. The colors are still vibrant. The video on Hulu.com is very informative and because it was produced by National Geographic Channel is well done. To view the 46 minute video go here on Hulu. A good article about the ancient book is on Wikipedia.